SECONDARY RAW MATERIAL OBTAINED FROM USED FUSED-CAST AZS REFRACTORY LININGS FROM GLASS FURNACES. Manufacture of concrete and shaped refractories. Cleaning and surface treatment applications. Special abrasive and ceramic applications. 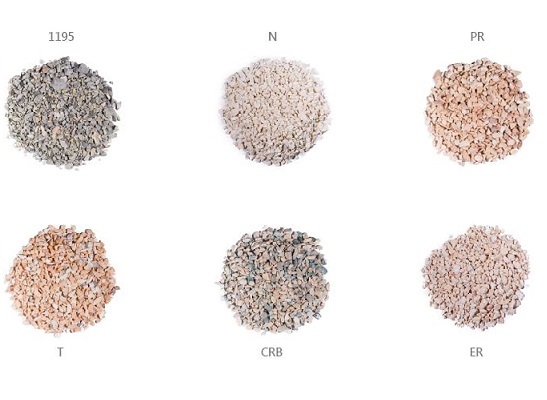 Secondary raw material obtained from used fused-cast AZS refractory linings of glass furnaces. Made from ER1195®, or equivalent, with over 93% ZrO2 content. Secondary raw material obtained from fused-cast AZS refractory linings from glass furnaces. Made exclusively from new AZS. Guaranteed free of glass, with over 36% ZrO2 content. Standard quality with over 35% ZrO2 content. Secondary raw material obtained from used cruciforms from glass furnace regenerators. Made from ER1682® cruciform refractories, or equivalent. Secondary raw material obtained from used glass furnace bottom sub-paving. Made from ERMOLD, or equivalent, with a 30% ZrO2 content.